An update on a project supported by an EMiC Ph.D. Stipend. Digital humanities productions (editions, archives, or other digital engagements) are increasingly sites of broader participation in textual interpretation, with how to evoke and harness “meaningful” crowdsourcing becoming an increasingly urgent question to scholars seeking a more public humanities. Elsewhere, I’ve discussed how borrowing the HCI (human-computer interaction) idea of “participatory design” can help digital humanities practitioners and their public audiences to mutual intellectual gain. As we use the Web to open the texts we study to a wider community of discussion, bringing in diverse knowledges and interpretive biases, I’m interested in how we can usefully structure the overabundance of information proceeding from public/crowdsourced contextual annotation of literary texts (contextual annotation means notes that give a context for a word, phrase, or other chunk of text, ranging from definitions of advanced vocabulary to more interpretive annotations). 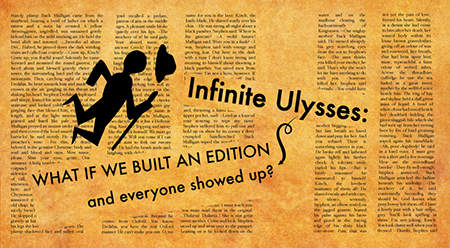 That is: my “Infinite Ulysses” project (one of several code/design projects forming my literature dissertation) is conceived as a speculative experiment: what if we build an edition and everyone shows up and adds their own annotations to the text, or asks and answers questions in the textual margins? When this quantity of voices is combined with an unusually complex text such as James Joyce’s Ulysses—or works developed in response to Joyce’s writing, as with A.M. Klein—how might we create a digital edition critical experience that adeptly handles not only issues of contextual annotation quantity but also quality? In addition to improving the ability of EMiC scholars to share their editions of Canadian Modernists with a wider, more participatory audience, I will test the scholarly use of this interface with two specific texts—a short work by Canadian author A. M. Klein subsequent to his introduction to the works of James Joyce, and Joyce’s Ulysses. This dual testing will let me trace resonances and dissimilarities between the two writings, developing a better understanding of how Klein’s Modernism built on and diverged from his readings in Joyce. Juxtaposing these two works allows me to apply the wealth of existing theorizations and questions about a digital Ulysses to the work of a far-less-often digitally theorized Canadian author—an extremely useful knowledge transfer packaged with a reusable participatory editing interface. EMiC’s generous support of a year of my dissertational work (through one of its Ph.D. stipends) has not only made this scholarly work possible in a practical sense, it has pushed me to look beyond my comfort zone of discussing the Joycean hypertextual to think about how such theorizing can extend to similar works that link back to the node of Ulysses. I’ve previously blogged about the overarching plans for my digital dissertation: about how I’ll be empirically user-testing both current and personal theories about textuality through code and design, and how I’m designing this building-as-scholarship towards helping everyone—textual scholars and the lay person—participate in our love for the nuances of a text’s materiality, history, and meaning. This post is about the first of my dissertation’s three coding projects: designing and coding an interface that allows a participatory, vibrant, contextualizing conversation around complex Modernist texts, with Ulysses being my main focus. Packed into one sentence, my research question for this first project is: What might we learn from crafting an interface to usefully curate quantity and quality of contextual annotation for complex Modernist digital editions (such as Ulysses), where the critical conversation is opened to the public? That’s a long sentence covering both more abstract and more concrete critical work, and I’ll be breaking it into manageable chunks with the rest of this post and those to follow. Despite there being no full digital edition of Ulysses against which to test these fears and assumptions, we already have some questions about what happens to a complex Modernist text when “everyone shows up”, and I’m hoping that by creating a site that experiments with allowing “infinite” contextual annotation of Ulysses (that’s where the “Infinite Ulysses” title of my project comes from), we can get a more realistic picture of what extreme annotation actually does to our experience of the text. When even someone as familiar with the text(s) as Ulysses editor Hans Walter Gabler can still learn new things about Ulysses (as he marveled during a class at the University of Victoria this summer), I’m confident that Ulysses will persist as always partially unfixed, always giving back more—and the Joycean digital theoretical work of Michael Groden and other digital humanists is ripe for carrying over to similarly complex Canadian texts. Quantity and quality, signal and noise. While the final effect of unlimited space to discuss and interpret the text remains to be seen, the “Infinite Ulysses” project will also tackle two more immediate problems: quality and quantity of annotation. If everyone is submitting annotations to a digital edition, how can we automate the massive task of curation and moderation of these annotations so that it occurs in a timely and unbiased manner? And once we’ve separated the wheat of critical yet diverse annotations from the chaff of repetitions, spam, and under-substantiated suggestions, how do we make the still-plentiful remaining material accessible to the users it would best serve? That is, how do we separate the signal from the noise when the “signal” of pertinent contextual annotations means different things for different reader needs? So: what happens to a complex Modernist text when we allow “infinite” annotations on it, and how do we work with “infinite” annotations to filter, order, and display those annotations best suited to a given reader? In a future post on this blog, I will explain the specific features I’m coding into my digital edition interface to approach these questions.